of Gatsby's parties. Complement your lovely sequins and fringe with Beelittle 1920s Accessories! to a shinning black elastic band that allows for easy adjustment. occasion, also in daily life. Lightweight and cute, will make a good outfit for your 20s party. Delicate 1920s earrings, sumptuous and dazzling! Will make you stand out from the crowd. flapper party. And is certain to send you back in time to the roaring 20s. ❤Feather Jeweled Headband, Retro style designed Crystal Silver Dangle Earrings and Shinning elegant necklace makes you unique and eye catching; Elastic Satin Ribbon can grip the hair more tightly. ❤Black smooth stretch elbow gloves. Stretchy and easy to put on; Wash&Care: Machine washable, hand wash.
❤Lightweight black cigarette holder is fully workable with real/fake cigarette. 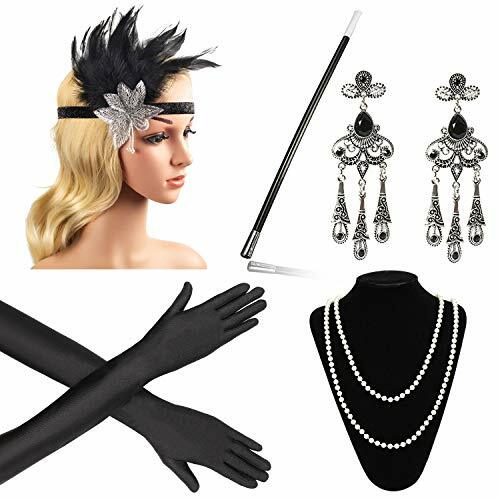 ❤Occasion:Perfect hair accessories for party such as Great Gatsby Headband or wedding party, cos-play costume, fancy dress party, good for 1920s 1930s party, prom and art deco occasions. ❤Package contents are all shown in the picture. One size fit most girls and women.